House at Park Guell entrance. Barcelona is a bit like Middle Earth with more colour. All these amazing rounded buildings following nature rather than the straight lines of more usual human construction. 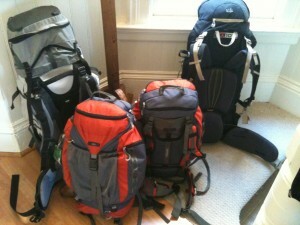 And lots of short rather hairy locals taking in the sights and sun. 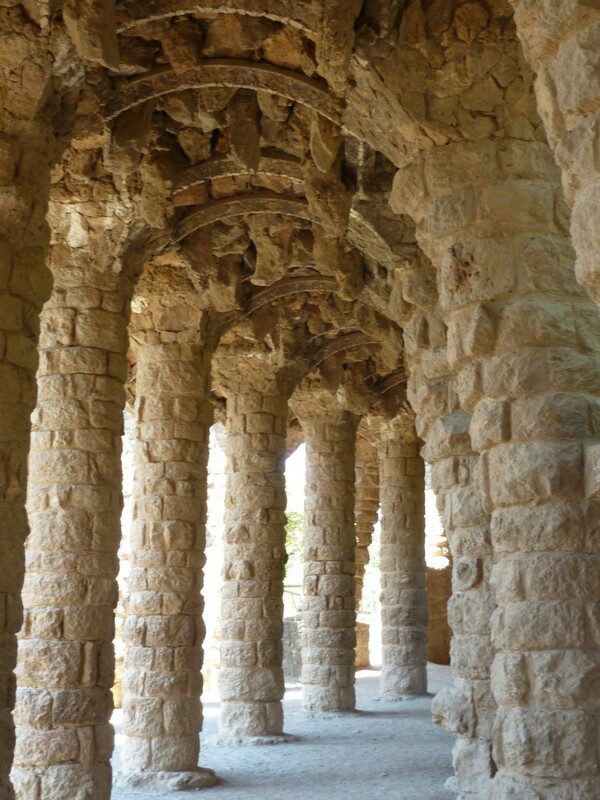 Angled columns in Park Guell. We began our day of sightseeing rather late in Park Guell. So before doing anything else we settled in for lunch watching the people parade through the park against a backdrop of the Barcelona skyline and the distant Mediterranean Sea. A cooling beer in the shade while watching the world go by has to be one of those great moments of travel. The beer was a necessity as we raised a glass to absent friends and remembered our last visit to Barcelona ten years ago with Rob and Jennifer V.
Sheet sellers on the run. Park Guell is a lovely place. It was designed by Gaudi as part of a failed housing estate. 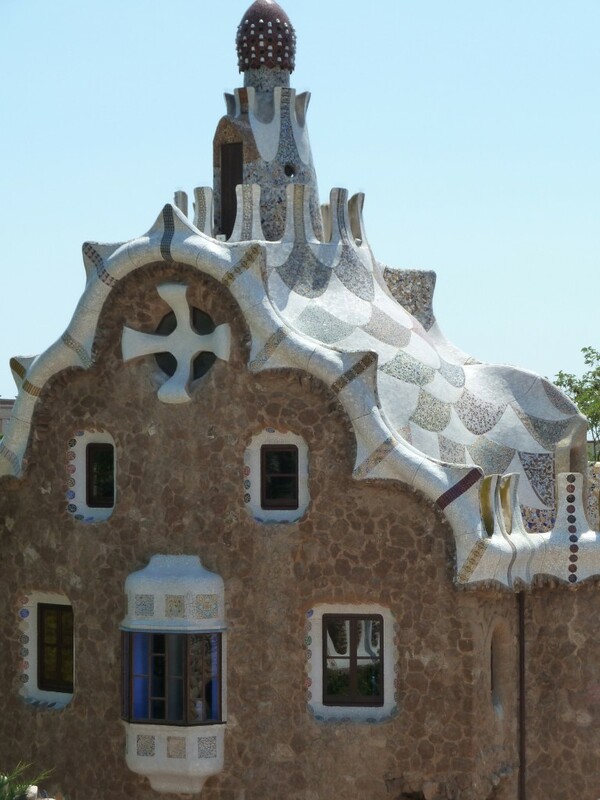 Gaudi was an unusual architect, preferring to work with clay models, rather than making drawings. From our lunch spot we could contemplate the terrace with its undulating seating which Gaudi designed using the shape of buttocks left by a naked workman sitting in wet clay. 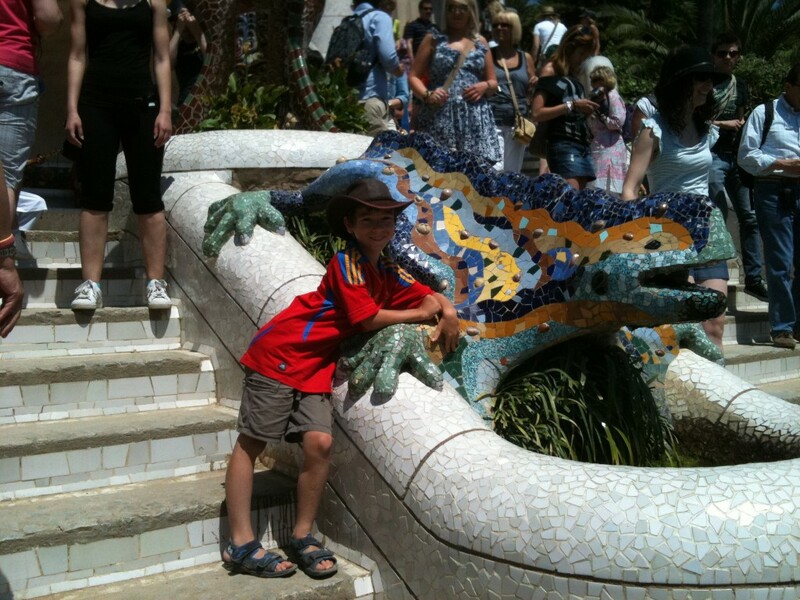 Declan and the mosaic dragon. The terrace itself was a mass of buskers and people selling sunglasses, fans, jewellery and all sorts of other sundry from spread out sheets. 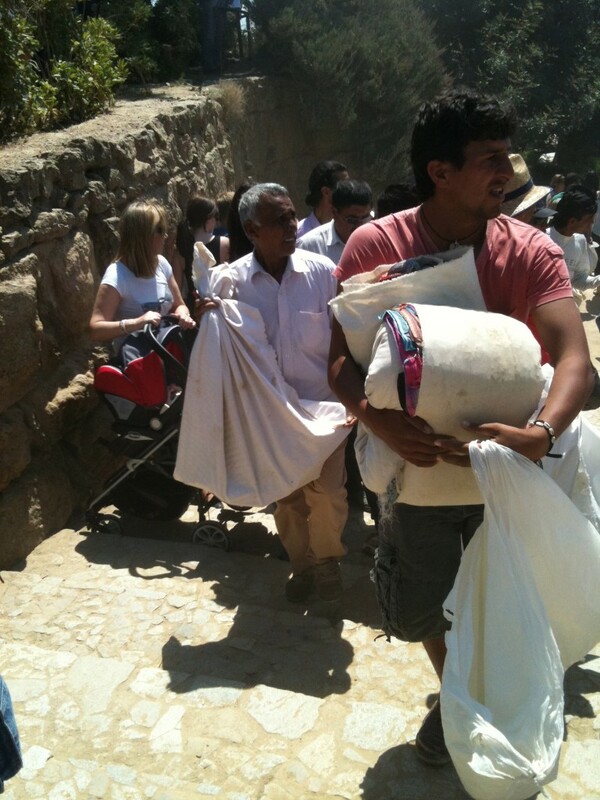 The use of sheets came into its own when the area was raided by the mounted police and the sellers gathered their wares into knapsacks and ran for cover. There’s obviously some sort of détente agreement between the sellers and police as the sellers did not run far and the police did not chase very hard. Maybe just a reminder of who’s in charge. We had a nice wander through the park marvelling at the various shapes and constructions to be found round every corner. The really noticeable thing is that everything is at an angle and three-dimensional. There just isn’t a right angle or flat surface to be found. After lining up with everyone else for a photo beside the mosaic dragon, we left Park Guell behind us and set out for the Ocean. 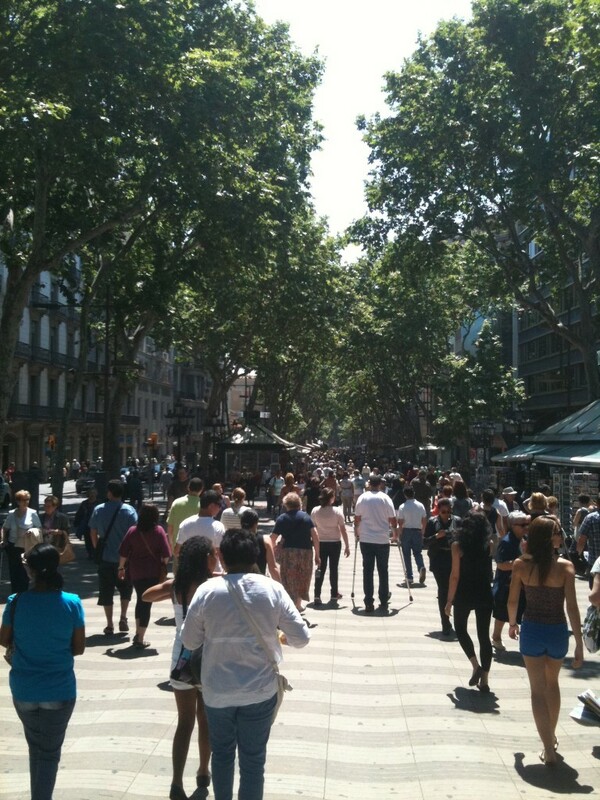 We walked down Las Ramblas because that’s what you have to do in Barcelona. I must say that although the kids bore up manfully, a walk down Las Ramblas is not a kid-friendly activity. It’s extremely crowded and there’s not much to grab their attention. It’s a big street [insert expressive shrug here]. 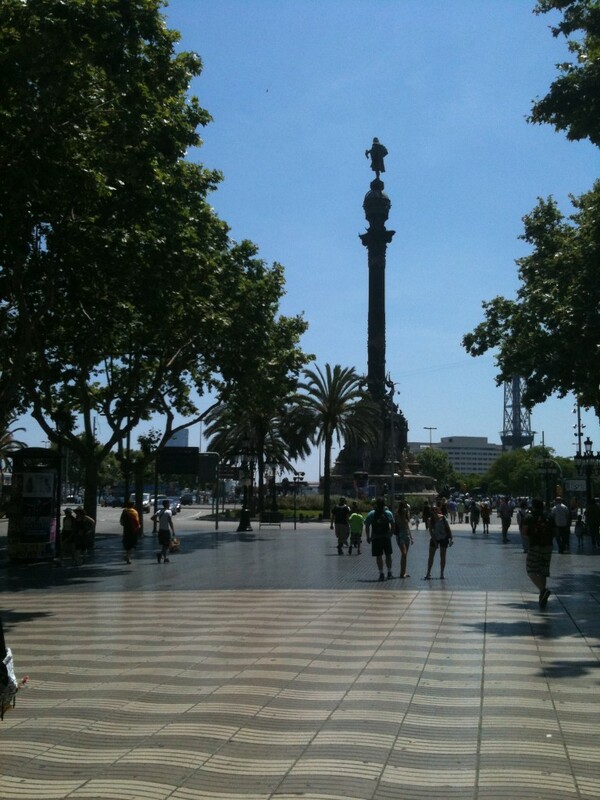 Finally we reached the Sea and the Christopher Columbus statue. We’ve spent a bit of time on old Christopher recently after visiting his purported birthplace in Calvi and Callum choosing to write a speech on him for schoolwork. The statue marks the spot where Columbus met Queen Isabella upon his return from the New World. Strangely his pointing arm does not indicate America but Genoa, where he grew up. Past the Columbus Statue is a mecca of all those modern New World things brought back over the Atlantic. A huge shopping centre features Starbucks, Ben & Jerry’s and every other franchise you can imagine. 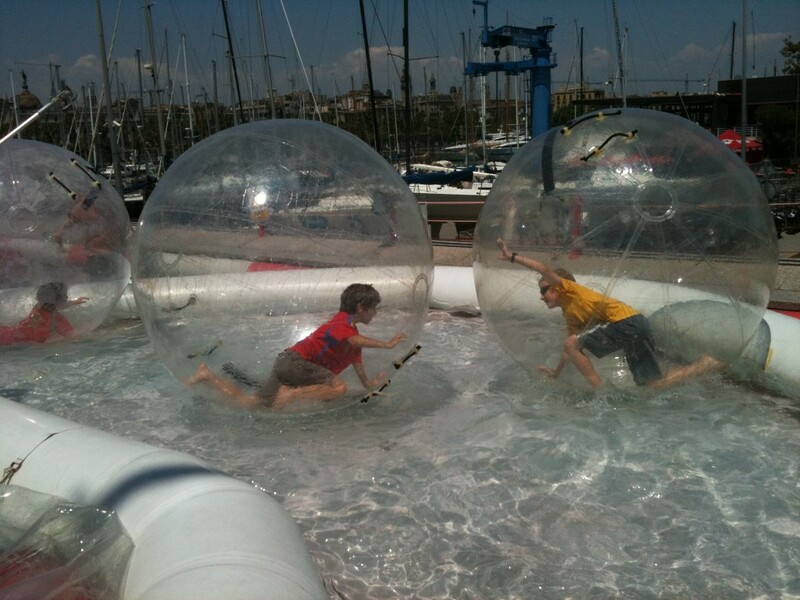 It’s also the home of the Bubbleparc where the kids spent a hot but fun quarter hour doing their impression of a mouse on a wheel. You have to think Gaudi would have quite approved of the bubbles as a way to round off a day in Barcelona.